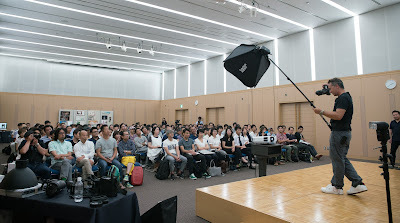 My big photography seminar... in JAPANESE! Me at the front there presenting in Japanese for a sold out audience in Fukuoka city. I was recently asked by Japan`s biggest album printing company Asuka to fly up to Fukuoka and speak at a seminar about photography. 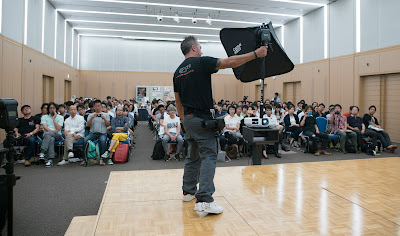 The catch was that the audience consisted of professional photographers from around Japan who of course spoke Japanese. 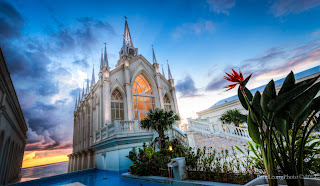 I figured I`d base my seminar on how to better use off camera flash for portrait and wedding photography because from my experience when I used to shoot weddings on main land Japan there was practically no one shooting with speedlites off camera. Of course people are shooting with studio strobes etc.. but for some reason shooting wirelessly with light weight little speedlights has not caught on in a big way yet as it has overseas. Perhaps because we have access to cheaper gear and knowledge of cheap lighting gear more overseas where as here in Japan most people only stick to name brand gear for their cameras. 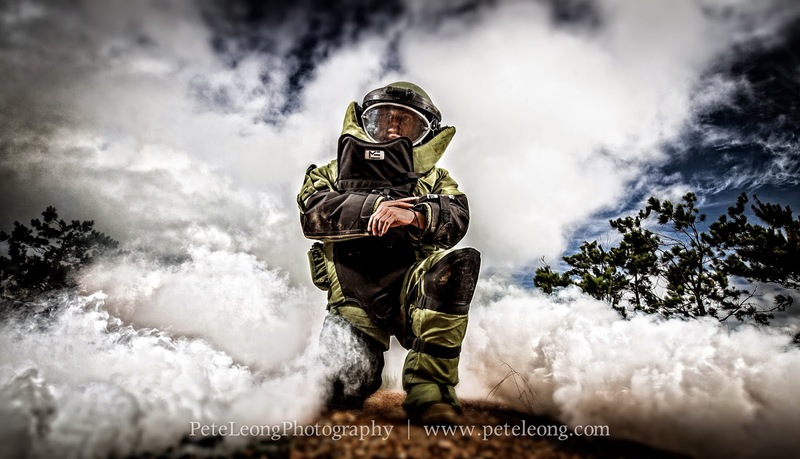 Im lucky enough to be an ambassador for the amazing Cactus Image flash gear. So I was showing and demonstrating how to use this gear and the benefits of using speedlights as opposed to studio strobes, off camera flash rather than on camera flash and various other techniques. I`ve taught a lot of photography workshops and seminars before but not many in Japanese and nothing ever this big. 130 people was supposed to be the limit but somehow I ended up with 170 keen photographers all ready to "take on my photo wisdom". I also demonstrated various Profoto gear as well because their latest b1 and b2 flash units are designed for location lighting. Showing one of my favorite flash modifiers, the Cactus CB60 softbox. The boom pole is actually made by Lastolite. One of the most popular bits of gear from the show turned out to be not flash related gear at all but my Spider Holster. If your not familier with Spider Holster thats the belt Im wearing thats holding my cameras in the photos for which I`ve also been an ambassador now for several years. The seminar went well and lots of people came up enthusiastically afterwards to meet and chat with me. 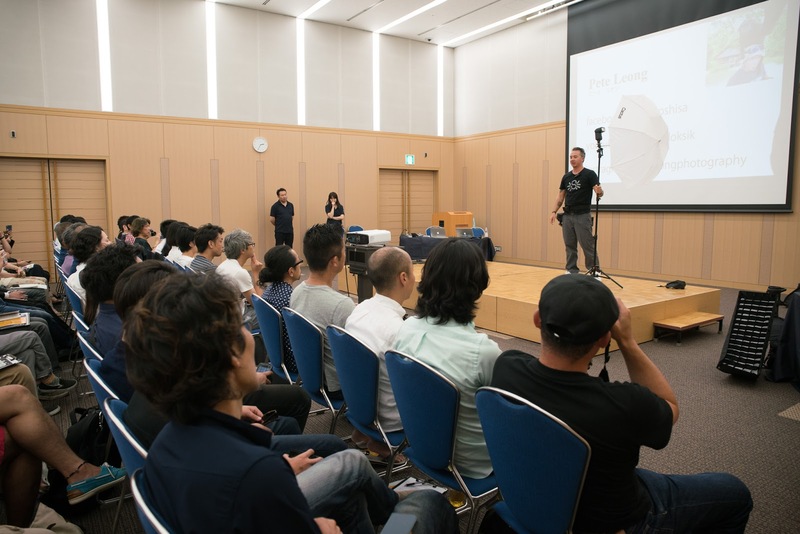 It was a great experience to talk in Japanese with such a big audience but not something I`d like to do too often even though I can chat just fine all day in Japanese its a different story when your teaching and trying to get your point across. Thanks very much for coming to check out my little seminar report. If your interested in learning more photography contact me for a private or group workshop tailored to your photography level. Also if you haven`t already come by and check out my main Youtube channel where I teach free photo tips and give reviews of gear.